But other threats that may be less ominous are likely far more realistic. An example: A hacker could use an artificial intelligence tool, which has been trained to interact with you like a spouse or a friend might, to trick you into divulging private data, like a social security number or a birth date. That scenario came from Bret Piatt, the CEO of San Antonio startup Jungle Disk, during a weekly podcast and radio hour he hosts about Internet and computer security. In the program’s inaugural episode on Sept. 24, “Machine learning and its security implications,” Piatt chatted with Charlie Rentschler, who works on the Google Cloud Platform, about the pros and pitfalls of a world that is increasingly collecting, storing, and using massive amounts of data to train machines to think and act more like humans. Without giving too many spoilers for the podcast here, Piatt offers some tips on how people can better protect themselves, such as by buying products like LifeLock, using two-stepfactor authentication, and considering using unique e-mail addresses when signing up for new services. “Folks have a general physical awareness of things you need to do [to protect yourself] but the digital awareness is not where it needs to be today,” he said in the segment. Piatt and Rentschler are by no means against the development of machine learning or artificial intelligence. They discussed the impact AI might have on areas such as cancer research or in business. Rentschler, a Google employee, emphasized the corporate world’s interest in using troves of data to more effectively sell consumers products. 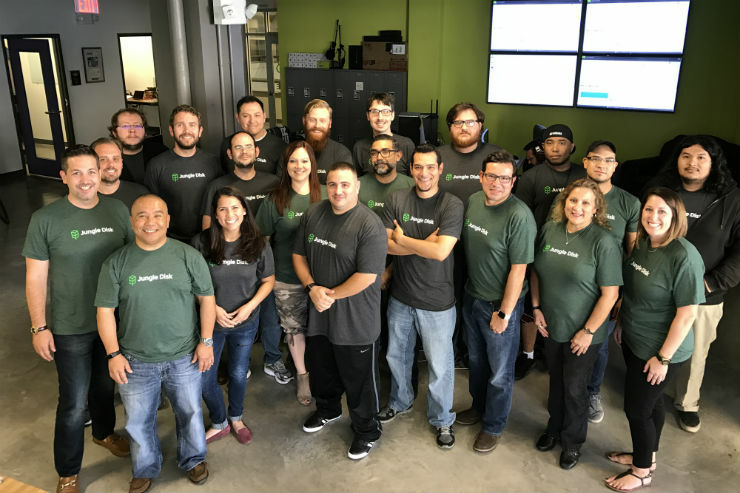 Jungle Disk sells encrypted backup services to small businesses, which typically have between two to 250 employees. Like competitors Carbonite and Barracuda, Jungle Disk says it will protect customers’ information and store untouchable backup versions of anything from legal documents to medical information in case a client’s system is hacked or accidentally deleted, Piatt says. Jungle Disk differentiates itself with things like pay-as-you-use pricing and fast data compression, among other things, he said in an interview. By 2011, Rackspace had stopped trying to add new customers to Jungle Disk, in part because the cloud computing giant was beginning to focus more on larger enterprise businesses rather than small ones, Piatt says. In 2015, Piatt began the buyout process of Jungle Disk with former Rackspace employee Huw Edwards, who is now Jungle Disk’s chief strategy and financial officer. Jungle Disk now has plans to push forward its research and development, particularly in offering backup services for small businesses that are putting data in software-as-a-service programs, and may raise additional funding to do so, Piatt says. Just because you have data stored in a cloud program like Google Apps or Office 365 does not necessarily mean it’s safe from a hack or from being accidentally deleted, he contends.